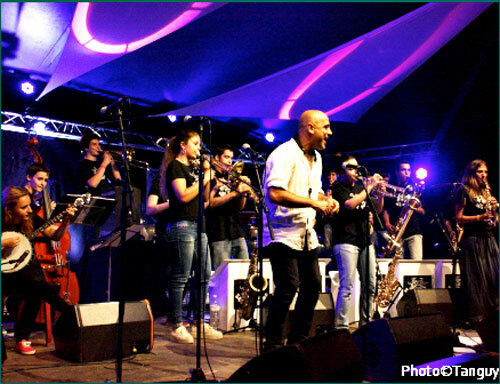 Thank you so much, Trevor Stent, for sending me the link to Philippe Briand’s amazing Web Review of Joan Chamorro’s young musicians’ phenomenal performances at Fest Jazz, Châteauneuf-du-Faou, in July. I am so privileged that Philippe included videos I took of the band and it adds to my enormous pleasure in being at Fest Jazz to film them. Over the months I have included several posts on Jazz&Jazz about Joan and his Barcelona Band. Where else in the entire world is there anything comparable? Trevor, please pass my thanks on to Philippe. 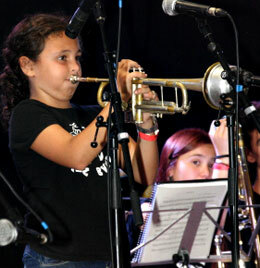 And Jazzers, do take the time to visit Philippe’s Souvenir Review and experience the magic of The Sant Andreu Jazz Band. Simply click here or on the photo of Elsa below. 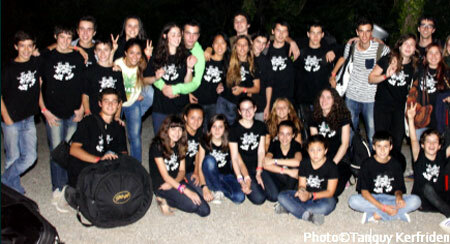 I am really pleased that you saw fit to publish my review of the Sant Andreu Jazz Band concert at Châteauneuf. Although my blog is basically a French language affair, I do like to write an occasional article in English, when I’m in the right mood. And the Sant Andreu kids put me in the right mood. Of course, the moment it’s in English, it goes round the world quicker. So, when I started this blog in 2007, I chose Papamutt as an alias. I wish the best of luck to jazzandjazz. Thank you so much, Philippe. We (jazz) have so much to learn from Joan and his brilliant youngsters. So keep in touch with any news about them at any time. Thank you so much for posting not only the wonderful videos of Fest Jazz but also the encouraging comments ; it really does give us a boost ! Philippe Briand is a legend of jazz in these parts and his article is excellent (his English is amazing too isn’t it?!). We are really thankful to you, Peter, for your support of our efforts to create a “modern” traditional festival and I hope the idea gains support in the UK before our music dies completely. Thank you for this, Trevor! It makes it all so worth while! It looks as though Jazz&Jazz stats will break all records this month and I’m sure that’s due in great part to you and interest in Fest Jazz, Tuba Skinny and Joan Chamorro! Just an additional word on Papa Mutt Carhaix, the name of Philippe Briand’s blog… it is also a pun on Carhaix which is the the nearest (10 miles) small town to Châteauneuf-du-Faou (and, incidentally, is the host to the French equivalent of the Glastonbury festival (170,000 spectators) the week before Fest Jazz). If you want a festival, come to central Brittany!. triste by joan chamorro has to be the most beautiful arrangement I have heard. More power to them, I say.